Travelers check in at a Malaysia Airlines counter at Kuala Lumpur International Airport in Sepang, Malaysia, July 18, 2014. 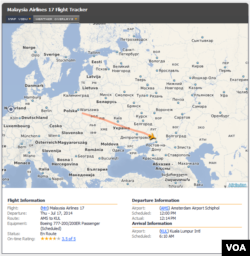 As investigators work to determine what caused Malaysia Airlines flight MH17 to crash in eastern Ukraine, airlines responded to the disaster Friday by rerouting flights around the conflict zone. The accident could impact Malaysia's beleaguered national carrier, still reeling from the disappearance of flight MH370. Aviation analysts say the crash of the Malaysian airliner over eastern Ukraine will trigger calls for a review of aviation safety, as initial assessments pointed to a ground-to-air missile hitting the aircraft at 10,000 meters. All 298 passengers and crew perished when the Malaysia Airlines flight from Amsterdam to Kuala Lumpur plunged to Earth in eastern Ukraine, where as many as four military aircraft have been shot down in the recent past. The Malaysian flight is thought to have included more than 100 AIDS activists, researchers and health workers - mostly Dutch nationals - bound for Melbourne, Australia to attend an international AIDS conference. The flight path taken by the Malaysian carrier had been subject to an official warning to carriers, known as a notice to airmen, or NOTAM, that several major international airlines had heeded and switched to alternative routes. But Hugh Ritchie, chief executive of Aviation Consultants International, says several Asian carriers had continued to fly over the Ukrainian airspace. Ritchie says this has raised questions about air safety. "To fly through this airspace knowing full well that it's got a problem there and to allow the airlines to put passengers in harm's way is unacceptable," he said. "I just find this appalling that they would just continue to fly over these areas." Ritchie says the International Air Transport Association (IATA) - the peak body in the aviation industry - should have issued stronger warnings to air carriers about the Ukrainian airspace. But a preliminary assessment by IATA said the doomed flight was operating outside the restricted airspace. Greg Marshall, managing director of the Melbourne based Flight Safety Foundation, says Malaysia Airlines had followed the Notice to Airmen warning and flown above 10,000 meters as recommended. Marshall says ultimate responsibility for the crash lies with those who fired on the plane, killing everyone on board. "This is an event where an aircraft is deliberately shot down," said Marshall. "Whether or not it was a case of mistaken identity, or if the perpetrators of this event considered the aircraft to be a military one or a civil one has yet to be determined. However, such an event is well and truly outside the carrier's control - that's any carrier, Malaysia Airlines or any other airline." March 28: Search shifts more than 1,000 kilometers northeast in the Indian Ocean following a new "credible lead"
The tragedy comes just months after the March 8 disappearance of Malaysia Airlines flight MH370 with 239 passengers and crew on board. Investigations so far have failed to locate the missing aircraft, thought to have gone down in the Southern Indian Ocean. The latest disaster had an impact on the outlook for Malaysia Airlines with shares falling up to 18 percent Friday. Some analysts are predicting the loss making Malaysian air carrier may collapse. But others, such as Daniel Wong - analyst with Hong Leong Investment Bank - says the tragedy is more likely to speed up corporate restructuring than sending the carrier into bankruptcy. Wong says Malaysia Airlines may now look to building business partnerships with other airlines as well as the sale of non-performing assets in order to raise funds.